A 15-year-old girl has been critically injured after she and three other young people were swept into the sea off the Irish coast during Storm Desmond. She was with a Dublin-based scout group at Hook Head, County Wexford, when a large wave swept them off rocks and into the water on Sunday afternoon. 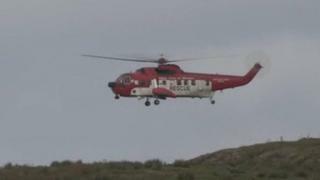 Two of the four managed to swim to shore, but the girl and a 15-year-old boy were winched to safety by an Irish Coast Guard helicopter. They were both taken to hospital. Coast Guard director Chris Reynolds told the Irish state broadcaster, RTÉ, that the girl was unconscious when she was taken from the water. He said he understood the boy tried to keep her afloat and that he was in distressed condition, with mild hypothermia, when the emergency services arrived. In a separate incident, footage has emerged of the moment two men jumped off Blackrock diving board in Salthill, County Galway during the storm. The pair have been widely criticised for risking their own lives.